Any man in uniform commands respect. My neighbor's son who is fireman loves his job because he finds saving people from the danger of fire an honorable act. His parents are proud of him and will tell us how their son loves playing with toy fire engines even when he was a toddler. So it was not a surprised that the son is now attached to the fire station 150 miles from his hometown. We only get to see him when he is on his annual leave and his parents will invite us over for dinner . We will normally have pot luck and I will bring a dish over or dessert :) This fireman loves my cheesecake and I never fail to bake one for him whenever he is back to see his parents. A months ago, the parents invited us to their house for Julian's 30th birthday dinner. Of course , I baked my special cheesecake for him and I also googled for an appropriate birthday gift for Julian. I wanted to get him a vintage toy model fire truck but it was beyond my budget. After a few days of searching, I came across Joy Jewelers fireman pendants which has a wide selection of beautifully designed fireman pendants. Hubby and I chose one that we know for sure Julian will love . Here below is what we ordered online for him. 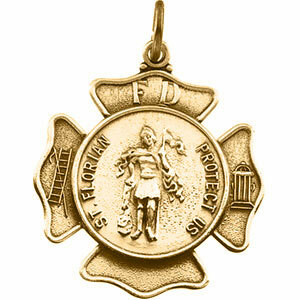 It was a St.Florian Medal Pendant -17mm -14k gold. Wow...I know Julian will love this fireman pendant. We wish him joy in serving the people and that he continues to enjoy his work as a fireman.